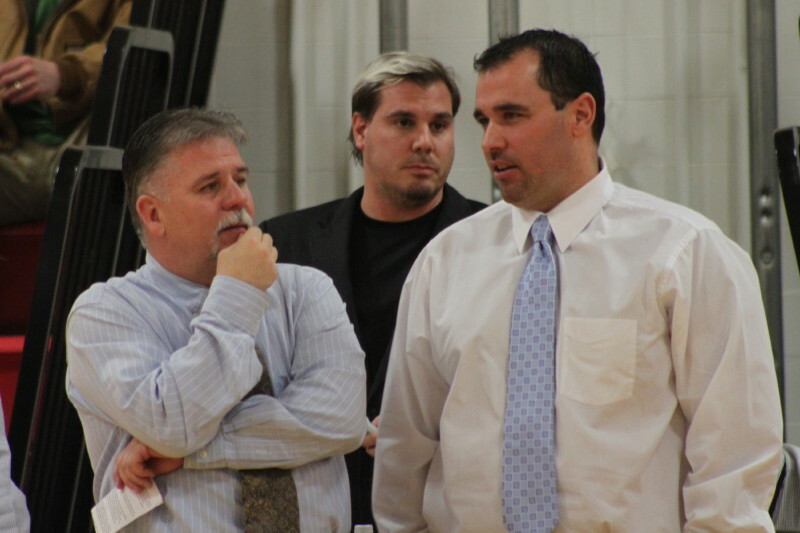 Amesbury coach Thom Connors and Newburyport coach Tom L’Italien chat before the season opener. 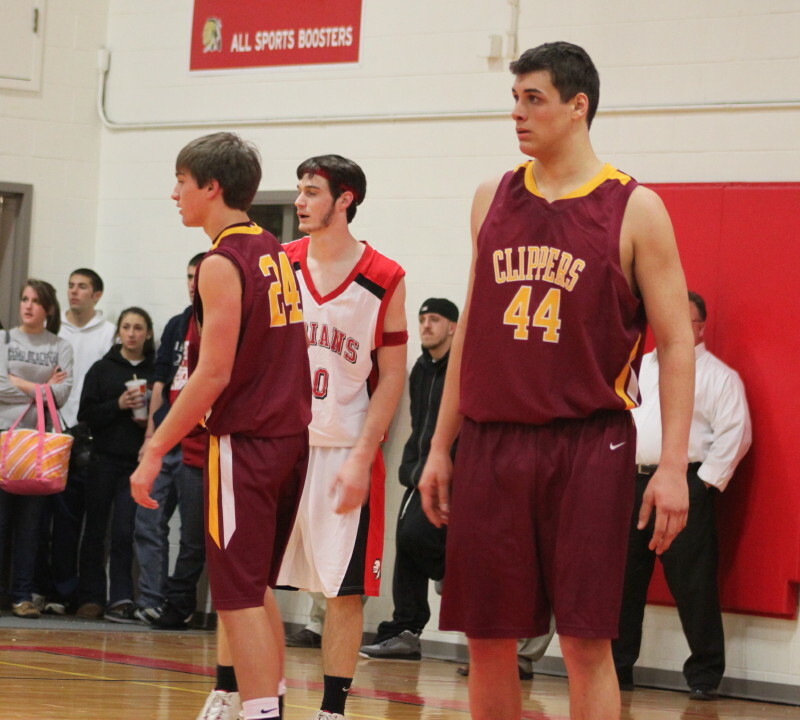 Clipper Chris Jayne tallied 13 points and did a nice job defending dangerous Stephan Deas of Amesbury. 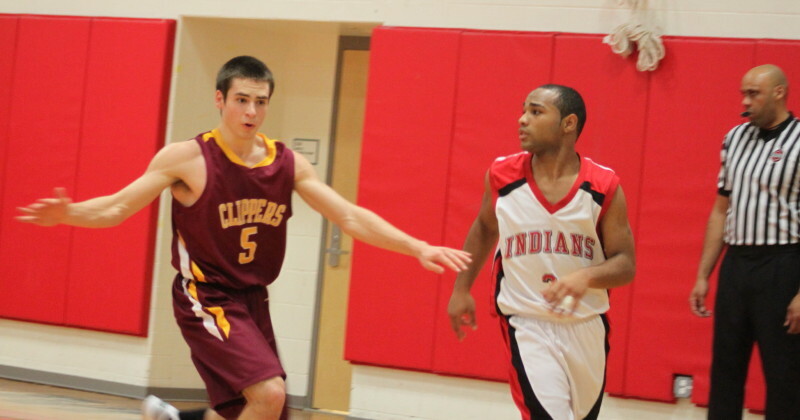 (Amesbury) The Newburyport Clippers (1-0) survived a terrible start and defeated the Amesbury Indians (0-1), 52-44, in the season opener for both teams on Tuesday night at Amesbury. The Clippers missed all seventeen shots they took from the field in the first quarter while the Indians missed all fourteen shots they took in the second quarter. First game jitters? Did that breeze from the outside escape into the gym? The difference in the game? While Newburyport was shooting poorly in the first quarter, Amesbury could only put seven points on the board because the Indians had nine turnovers. On the other hand, when Amesbury turned cold in the second quarter the Clippers put together a 9-1 run to get the lead (11-8) and later nine straight to start to pull away, 22-12. In that crucial second quarter Newburyport showed long range accuracy (Matt Leavitt/Zach Fenton/Chris Jayne) and inside strength with rebound conversions by Ian Michaels and Eric Meyer. Matt Leavitt was covered closely (here by Stephan Deas) but his consecutive 3’s early in the second half gave Newburyport a 15-point lead. Matt Leavitt put two 3’s together in the first minute of the 3rd quarter and Newburyport was away 30-15. In the 4th quarter it was Chris Jayne’s turn to put a couple of 3’s together and his twosome gave the Clippers a 49-30 spread with 4:40 left. This was more than enough despite a late seven-point unanswered rush by Amesbury in the last 2:46 of the game. The Clippers showed plenty of offensive weapons after the slow start. They also took very good care of the ball with just 13 turnovers – 3 of them came in the last frantic two minutes of the game. The Clippers also have some outside shooters. Their top scorers (Matt Leavitt and Chris Jayne) each registered thirteen points. I kept no rebound stats but you should know that Newburyport had 21 more shots than Amesbury. There were thirteen times that the Clippers had an extra shot at the basket. Amesbury had just five. 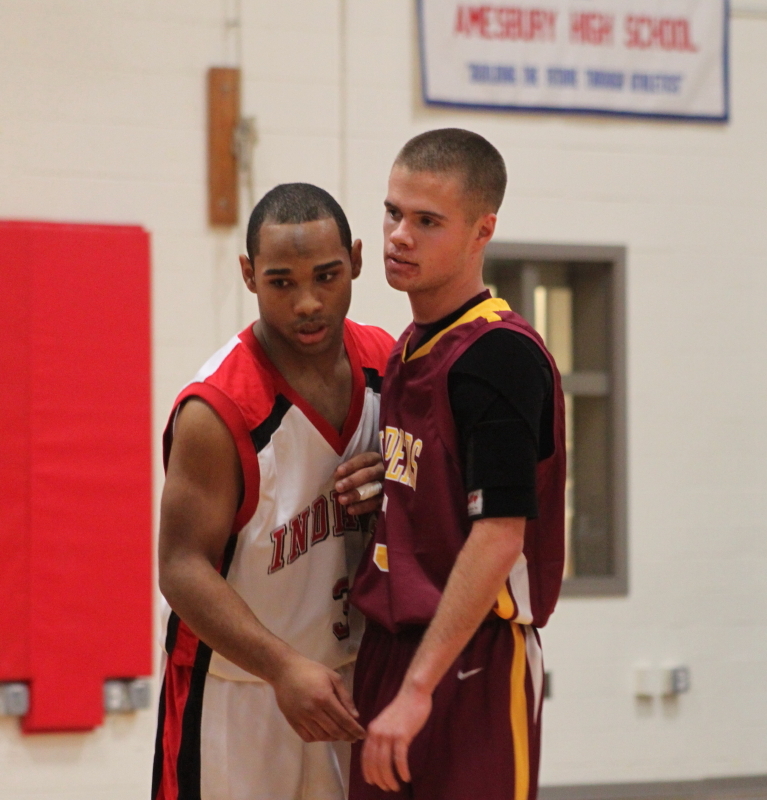 Matt Talbot led Amesbury’s scorers with 18 points. He didn’t create his own offense but could make an open shot including four 3’s in this one. Stephan Deas ended up with fourteen points but an excellent defensive job by Chris Jayne was evident. Newburyport also employed a zone that gave Stephan few good looks. The speedy junior deserves the special attention. A good crowd turned out for the season opener. It looked as if one Amesbury student got the gate while a Newburyport 26-0 sign didn’t last the entire game. The enthusiasm in both sections was evident.